Join the world's leading archeologists, historians and scholars as they search for the truth about one of the Bible's most legendary villains. On the extreme eastern edge of the Roman Empire, Herod ruled the earthly kingdom into which Jesus was born with a cruelty born of paranoia. Killing any who stood in his way, Matthew's Massacre of the Innocents describes his attempt to murder the infant Jesus by sending troops to slaughter every male child in Bethlehem under two years of age. Yet, at the same time Herod raised some of the architectural marvels of the Roman world ? the brilliant new Temple in Jerusalem ? the largest man-made structure in the Empire, Caesarea Maritima, the world's first fully man-made harbor with sumptuous palaces, temples, hippodrome and amphitheater that he wished to rival Rome, and more. In the words of the 1st Century historian, Josephus, Herod "stole the throne like a fox, ruled like a tiger and died like a dog". 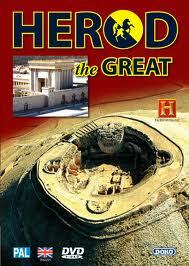 Obsessed by the kingdom of this world, Herod the Great was the complete opposite of Jesus ? a man whose life can be summed up by the anonymous saying "Greater is he who acts from love than he who acts from fear". Doko Media looks forward to serving you, your family and your community. Our wonderful Bible Land journey is shown to you on best quality DVD with our full customer service and shipping guarantee.